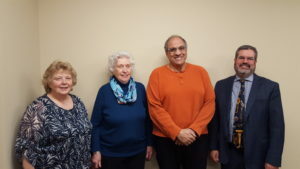 In January, the Hiscock Legal Aid Society Board of Directors said good bye to long time and dedic ated board members. Collectively, these members have served on the board for more than a century. They have each left their mark on the Board as well as the agency. Pictured: Anita Cottrell, JoAnn Wallace, Anthony J. Malavenda, and Samuel C. Young. Not pictured: Carl Pesko. Get news straight to your inbox. Sign up now for the latest updates about us. Funded in part by the IOLA Fund of New York State. Copyright © 2015 Hiscock Legal Aid Society. All Rights Reserved.